Posted on December 25, 2009 by EL CHAVO! For those that were breathlessly waiting for a follow-up, here it is. Birth of a new tradition? Another hint at the end times? Pre-post-post-Chicano food? Whatever this means, yours truly, despite the yucks and boos from the gathered crowd, went ahead with the making of a Kraft Cheez tamal. You know, that food-like orangey product in individual slices. The verdict: hey, that’s not so bad! I did add some rajas and papas to the mix, so that made it worthwhile. But it kinda failed cuz I thought it would be all melty but instead it just globbed up, maybe singles aren’t meant for a 2 hour steam bath. Hmm, on second thought, maybe I should have added 2 slices. No te hagas, you know you want some. This entry was posted in culture, Eastside, history, Pendejadas, The Ethnics by EL CHAVO!. Bookmark the permalink. Disgusting! 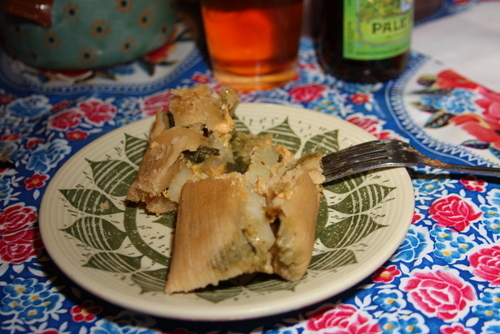 Your tamal making privileges should be revoked. Stop using LAEastside to spread your Kraft Cheese tamal rhetoric! Maybe Velveeta will be melty. If you are interested in exploring your cheese/”cheese” options, please let me know if you ever get around to using cheese from human breast milk. Food-like? Even that is pushing it. “Not so bad” is not good enough coming from you, Chef Chavo. I see you added other ingredients to take away from the now cheetoz-like growths in the tamales. Good move. I may have to call the hazmat team. btw I don’t want none. You made Baby Jesus cry. Chavo, you should use your power for good, not evil—Jeesus, it’s CHRISTMAS!! That looks like a fork full of wrongness. It’s America in a tamal! I doubt this concoction would’ve been concocted in Mexico. I do have to share that for breakfast Xmas morning i did fry an egg and lay it over a delishious tamal. I was going to enter Spam tamales in the LA County Fair as part of the Spam contest but my Mother said she wouldn’t speak to me again. The next year, someone did and they won $100. I’m thinking Spam and Velveeta with Pace picante sauce next year, Dios me salve.